 It's a mystery why these splendid reminiscences of a gentleman ranker who served with the US Army's 101st Airborne Division in Europe during the climactic months of WW II were rejected by book publishers following their completion in the late 1940s. However, the frequently sardonic, dead-honest text proves well worth waiting for. A Harvard student before his induction, Webster signed on with the parachute infantry, a posting that earned him the privilege of dropping behind German lines early on D-day, long hours before Allied forces launched their coastal assault on France's Normandy Peninsula. Having survived the invasion and its aftermath, the author made his second and last combat jump into Holland for the Arnem campaign, during which he sustained a leg wound that took him out of action for nearly five months. 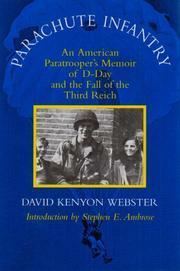 Rejoining his unit at the start of 1945, Webster helped chase the battered but still deadly Wehrmacht through the Rhineland and into Bavaria. At war's end he and his comrades-in-arms were drinking Hitler's champagne in Bertchtesgaden, the FÅhrer's fabled Alpine redoubt. Occupation duty soon palled, however, and the author pulled all available strings to get himself stateside for demobilization. Webster, who went on to become a reporter with the Wall Street Journal, penned his memoir shortly after discharge, drawing mainly on letters he had written from Europe. A permanent private with the soul of a short- timer, he had many complaints about the chain of command, in particular its propensity for thoroughly briefing the troops before any action and leaving them in the dark once the shooting started. He also understood that the ties that bind men in battle have more to do with brotherhood and its obligations than either God or country. Webster's words will ring a resonant bell with the legions of GIs who rather enjoyed soldiering under fire but despised the military for its chickenshit rigidity.